The PRS-700BC Reader Digital Book is the newest chapter for Sony in the developing saga of the eBook readers. This reader has a very impressive 6.0-inch, touch screen display, which lets you turn pages with the slide of a finger. It uses an electronic paper display developed by E Ink Corporation that has 166 dpi resolution, four levels of grayscale, is viewable in direct sunlight, requires no power to maintain a static image, and is usable in portrait or landscape orientation. In addition to a built-in light, you can also create annotations with a virtual keyboard, highlight text with a stylus pen, search for text and easily adjust the font size. A faster processor gives you quicker response times when opening content or turning pages. It's not just about using it to read digital books. 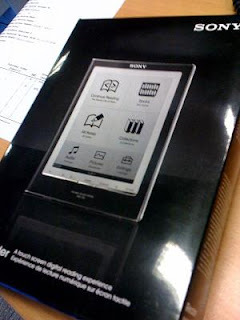 The Sony® PRS-700 Reader Digital Book includes an eBook Library 2.5 PC Software, an iTunes Store-like interface to purchase books from Sony Connect eBook store. It also can display Adobe PDFs, ePub format, personal documents, blogs, RSS newsfeeds, JPEGs and Sony's proprietary BBeB ("BroadBand eBook") format. Publishers including Harper Collins, Random House, Simon & Schuster, and Penguin are offering texts in the epub format. The Reader can play unencrypted MP3 and AAC audio files. With thousands of eBook titles available at the eBook Store from Sony and other participating websites, you can choose to download new releases, classics or other popular book titles. Its long battery life lasts up to 7,500 continuous page turns, (or up to two weeks of reading) on a single charge. The internal memory will hold approximately 350 average size digital books and hundreds more with an optional removable Memory Stick or SD memory cards. Sony introduced its eBook Reader in 2006 with the PRS-505 model. Now these models , can also be access and accept secure and non-secure ebooks in the ePub format. These models are available in Sangria Red, Silver and Dark Blue. Current owners of the PRS-505 model can upgrade their units from the Sony support site: http://esupport.sony.com. The PRS-505 model Readers will continue to support BBeB formatted eBooks offered at the Sony eBook Store. So these users can retain and grow their current collections of eBooks without having to reformat or repurchase them. All files are conveniently managed by the eBook Library software. The sony Readers compete with other electronic book devices such as the Amazon Kindle and now the Kindle 2, iRex iLiad, the Jinke Hanlin eReader, and CyBook by Bookeen. One major feature that is noticeably lacking in Sony's latest eBook reader is a wireless connection. The Kindle can download e-books from Amazon over a Sprint EVDO wireless connection or by connecting it to a home computer. My name is Mario Del Sol and I offer no hype or false claims, just the honest truth. I have many interests, eBook Readers is just one of them. If you would like to learn more about ebook readers check out The eBook Readers Guide.